Are you going for a costume that is on the brighter side this Halloween, perhaps a clown or some sort of fairy? Do you need the perfect finishing touch to your St. Paddy’s Day outfit? Well, your search is over! Take a look at these amazingly vibrant Kelly Green Nylon Tights. They will be the perfect addition to a number of costumes and outfits for the coming holidays! Green is a great reminder of nature and everything that goes along with it, like freedom and growth. So you can imagine how easy it will be to put a smile on everyone’s faces when you enter the party scene glowing of green this year. 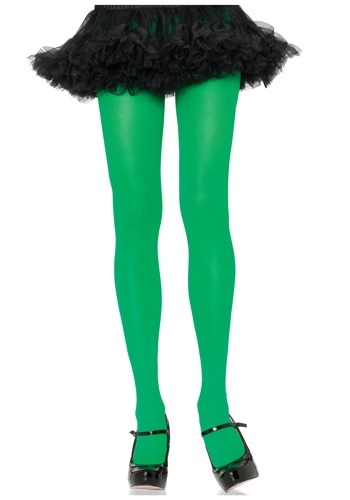 These opaque tights are made up of 100% nylon and will make your legs 100% green. Be sure to take a look through the rest of our St. Paddy’s accessories so you can be the greenest one out on the dance floor. Just be sure to keep an eye out for any of those troublesome leprechaun hunters, wearing this much green might confuse them!